Is there a Homeowners Association? What are their duties? By virtue of owing property within Pedregal de La Paz, a homeowner is required to share in the payment of these services by paying their homeowners dues and special assessments if given the case. Since the community is set upon a Condominium Regime, fees are different to all homeowners and are based upon their corresponding undivided interest. Fees are set in pesos and paid on a quarterly base. Can I use the Tennis Club? All Pedregal owners that are up to date with their homeowner’s fees are welcome to use the common areas and Tennis Club, which include tennis courts, gym and soccer field. What are the Homeowners regulations? Regulations include anything that is important to consider for the wellbeing of the community and security of its residents: from trash disposal and speed control to tolerant noise volume. Are there any construction regulations? Yes, these regulations are based on the desire to preserve the natural beauty of the development as well as to promote an integrated environmental design, protecting the value of the real estate properties of current and future residents whilst assuring panoramic views from all houses and lots. The Design Assessment Board is in charge of reviewing each one of the sets of plans that are presented for their approval, in order to verify that such plans comply with all the adopted rules and guidelines. How much does it cost to build on a lot? Every case is different and depends on the topography of the terrain, your building preferences and the materials you wish to use for your home. What should I consider to begin building on my lot? When designing your home, the views and privacy must be considered as a priority. You should also have final building plans duly approved (stamped and signed) by the Design Assessment Board, including each and all of the requisites to any variation, if applicable. And most importantly, the relevant construction license shall be obtained issued by the Municipality of La Paz. A sample copy hereof shall be attached to the file of such construction work. Yes. 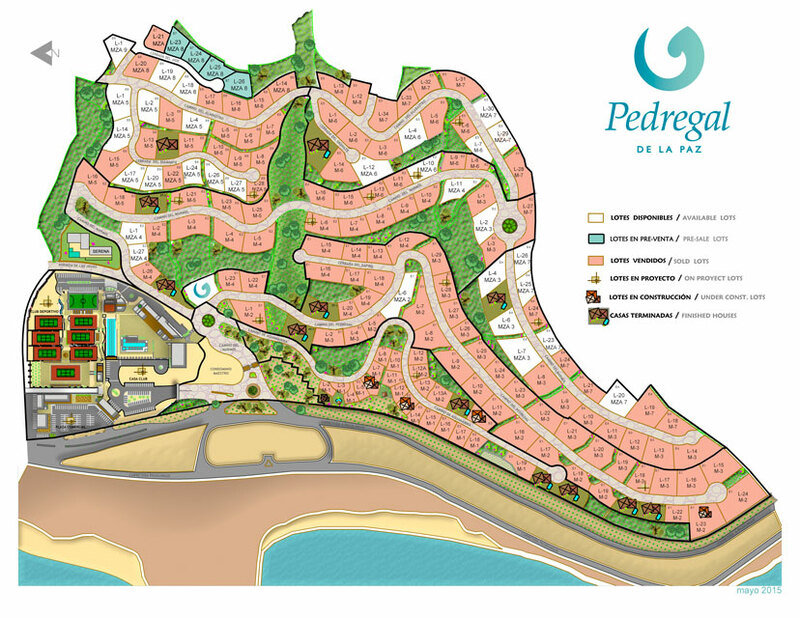 Pedregal de La Paz Developer offers different financing opportunities within its own inventory. Plans can range from a year to a twenty-year period of time with a very competitive interest rate. Your Pedregal Agent can show you the inventory and explain into more details the financing programs. What is the cost of utilities such as water and electricity? Water and electricity bills depend upon consumption but is a flat rate in both cases. I heard water is scarce in the area. How is it within Pedregal de La Paz? Pedregal de La Paz prides with its own desalinization plant that serves water to all residents. The community also features a treatment plant which irrigates all common / green areas and serves the Tennis Club. If you are considering building a property for you and your family, why not do it in the area with the most investment value and added amenities in La Paz? Here are some of the advantages of buying within Pedregal de la Paz and building your home. • You get to choose the location and size of your lot. Ocean view, second row, corner lot, double-access lot, deep-sloped for a multilevel residence… possibilities are endless. • Once you’ve chosen the right one, whether on your own or with the help of an architect you can render your future property based on your needs and likes: where the entrance will be, how tall you’d like your ceilings, how much to leave as a garage + storage room, etc. • You get to choose the materials, finishes and quality of each single element that will constitute your home: white marble, wood floors, iron railings, tempered windows, concrete kitchen, etc. Each of these elements play an important factor when looking for a more contemporary design with a minimalist approach, or a more classic yet functional home. • Buying is also budget friendly! From day one you can determine how much you can spend. If you have a limited budget you can choose to build by stages and leave preparations for future updates or additions. I strongly recommend to always leave a margin as a reference in case there is an extra expense and you can finish on time and how you had planned it. • There are several construction firms in the area that are well established and have experience building in Baja California Sur. They can help you plan, manage and guide you throughout the construction process and will take care of all the paperwork, permits and needed documents to finish your property. Whether buying an existing home or building to your needs, it is important that your personal signature is visible, this is what ultimately turns a house, any house, into a home! Feel free to let your favorite Pedregal Realty Agent know how you feel and any other questions you could have. Market knowledge, presence and experience. We will provide you with a written CMA (Comparative Market Analysis) for your property. Pedregal’s experienced real estate agents will refer to the recent market data, the current pool of comparable properties on the market and what’s being sold recently to come up with a number that will strategically place your property on the market. Marketing strategy. Activities will include (but are not limited to): social media shares, website presence, email marketing and tour organization with clients and other brokers. Reach and communication. Your Pedregal agent will regularly update you with any new information/concerns, tour and comments from fellow agents and prospects. If you decide to seek the help of an agent when selling your property in Pedregal de La Paz, you need some good information before you make any moves. Let the local experts help and guide you throughout the entire process.